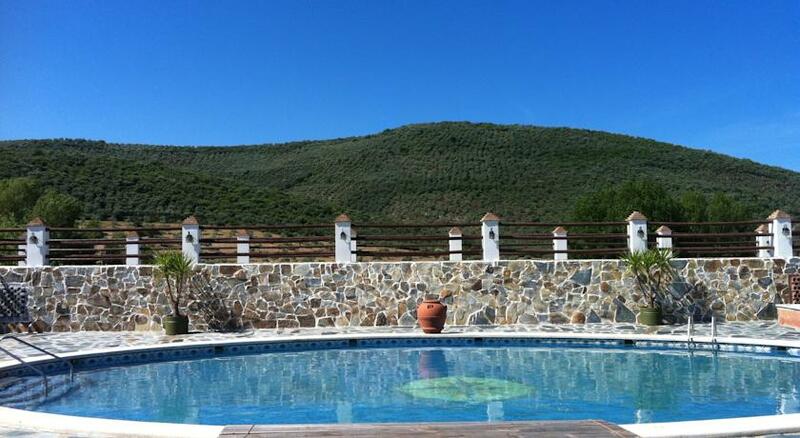 Near to both Seville & Cordoba but very much in the wilds of northern Andalucia, Spain, this charming farm stay has a variety of rooms and suites on a working organic farm with an outdoor swimming pool. It offers horse riding lessons too and has ready access to some of Europe’s most enchanting landscapes including the beautiful Sierra Norte de Sevilla Nature Reserve. They have a range of rooms; both doubles and triples as well as a larger double suite. And all of the rooms are spacious and clean and come with with private bathroom, WiFi, air conditioning, and heating. There is also a very nice outdoor terrace with barbecue facilities and of course the swimming pool. And the owners can provide a very good breakfast every morning for a small extra charge which includes some of the farm’s own organic produce. The main attraction at the farmtay are the horses; they train horses here and can provide horse riding lessons to guests as well as horse riding tours in the surrounding area. It’s not just horses though, they have an orchard and vegetable plots and they also keep sheep goats, hens and a peacock, and guests are welcome to meet all of them. The surroundings; the Sierra Norte de Sevilla Nature Reserve is a truly spectacular region full of old European wildlife that have been pushed to, or towards, extinction in most other parts of the continent: Imperial eagles, black vultures, black storks, mongeese, wolves and wild boar to name but a few. The area has what’s know as a Starlight Certification, which is to say that such is the lack of artificial light in this remote region that the stars at night seem to shine extra brightly, as bright almost as they would have done thousands of years ago. If you’ve spent most of your life in a city you will probably be pretty impressed. There is a telescope at the farm stay too to take a closer look. What is notable too about the reserve is that it does maintain a balanced amount of sustainable, small scale agriculture in keeping with the cultural tradition of the area, and there are some lovely small villages too, including of course at its edge, Guadalcanal, where the farmstay is located and which, though small has a few good places to eat and then, moving south through the park; Alanis, San Nicolas del Puerto, Cazalla de la Sierra and the bigger town of Constantina all can offer extra insights into the culture, the people and the food of this unique area.